maNavALa mAmunigaL sings glories and mangaLams to SrI rAmAnuja in this pAsuram starting from the latter’s lotus feet and proceeding gradually up towards his head. maNavALa mAmunigaL feels that SrI rAmAnuja would have been tired after the long list of debates he had with people from other philosophies. maNavALa mAmunigaL envisions SrI rAmAnuja as one who is seated with SrI bhAshyam and thiruvAimozhi in his hands. This striking pose captures the imagination of maNavALa mAmunigaL and hence he goes ahead and sings glories to each and every part of SrI rAmAnuja and wishes that each one of them should live forever. inithiruppOdu yezhil gyAna muththirai vAzhiyE!!! vAzhi – Live for eternity!!! sIr Arum – and that is replete with auspicious qualities. ErArum – that is filled with beauty all over it. ilangiya munnUl – the sacred thread that establishes the fact that reinforces that he is the greatest student of vEdhic scriptures. The thread that is like a sheath of thunder on an evening sky known as his body, long live!!! sOrAdha thuyya cheyya mugachchOdhi – the glow of SrI rAmAnujathat does not have any bounds, is pure and effulgent. This is caused by (a) the happiness derived from seeing SrIman nArAyaNan and HIS devotees (b) the process of destroying the arguments of non devotees. thuNaimalarkkaNgaL – the pair of beautiful eyes that sees (a) SrIrangaSrI (periya perumAL), (b) SrIvaishNavaSrI that was corrected by SrI rAmAnuja (this includes everything in this world that surrendered unto the louts feet of SrI rAmAnuja). Those eyes look with utmost compassion towards those who surrender to him and that diving glances make them pure. IrAru thirunAmam aNindha ezhil – the twelve divine resplendent “thirumaN kAppu” or “Urdhva pundRam” on the glittery rose body. This is similar to seeing white lotus (thirumaN kAppu) blossoming on a golden mountain (body of SrI rAmAnuja). This thirumaN kAppu is a manifestation of the aforementioned qualities and trait of SrI rAmAnuja and is something that ensures that the “SrIvaishNavaSrI” spreads across. yezhil – that is beautiful (because the pose represents the essence of meaning of both samskrutha and thamizh vEdhas). In this pAsuram, maNavALa mAmunigaL sings maNgaLAsAsanam to SrI rAmAnuja. He starts with the divine lotus feet, the saffron robe, his whole body as such, his brahma sUthram, his powerful shoulders, his beautiful smile, his compassionate eyes, his “thirumaN kAppu” and finally the gyAna mudhrai in which he is seated among his devotees. In this pAsuram, maNavALa mAmunigaL sings glories (mangaLAsAsanam) to SrI rAmAnuja. He starts with singing glories to SrI rAmAnuja’s divine lotus feet and wishes that they should live for eternity. SrI rAmAnuja is the leader of yathis and is replete with auspicious qualities pertaining to svarUpam, rUpam and characteristics, the very same qualities that are yearned by his devotees. As described as “amarar sennipU (thirukurundhAndagam 6)” and “irAmAnusan adip pU (rAmAnusa nURRanthAdhi 1), SrI rAmAnuja’s lotus feet is something that presents itself as something that is to be enjoyed fully and is something that adorns our head. Such a lotus feet should be there for eternity without anything happening to those divine lotus feet. Next, maNavALa mAmunigaL sings glories to the saffron robe that SrI rAmAnuja adorns around his frame. He wishes that it should be there forever as well. [The reason for saffron robe is explained in this section. There are two excerpts that are taken to describe the saffron color. (i) There is a chUrNikai in SrI vachana bhUshaNam that says “ARu prakAraththAlE parisudhdhAthma svarUpaththukku thathsAmyam uNdAyirukkum (SrI vachana bhUshaNam 240)”. The essence of this chUrNikai is that all souls are comparable to periya pirAtti, when the souls realize their true nature. A soul has six defining characteristics that are (a) ananyArha SEshathvam or the quality of not being a servant to anyone other than SrIman nArAyaNan (b) ananya SaraNathvam or the quality of not taking refuge under anyone other than SrIman nArAyaNan, (c) ananya bhOgyathvam or the quality of not being an object of enjoyment to anyone other than SrIman nArAyaNan, (d) samSlEshaththil dharikkai or the quality of being able to sustain/survive [only] during union with SrIman nArAyaNan (e) viSlEshaththil dhariyAmai or the quality of being unable to sustain/survive when separated from SrIman nArAyaNan and (f) thadhEka nirvAhyathvam or the quality of being controlled only by SrIman nArAyaNan. When the soul is able to realize its true traits, i.e. the six aforementioned traits, due to the causeless mercy of SrIman nArAyaNan, it is on par with periya pirAtti who is epitome of nAyaki lakshNam and have realized these six traits always. Now the second except is the phrase “sIthakAshAyavAsini”]. From these excerpts, it goes to be say that the saffron is a color that signifies “pArathanthriyam” (the quality of completely dependent on the master and obeys HIM without any question) and “ananyArhathvam” (the quality by which a soul is not reserved for anyone except for SrIman nArAyaNan). maNavALa mAmunigaL describes this beautiful saffron robe that is similar to sun in color and that which perfectly adorns the frame of SrI rAmAnuja. Next, maNavALa mAmunigaL sings glories to the dhivya mangaLa vigraham (divine body) of SrI rAmAnuja. maNavALa mAmunigaL describes SrI rAmAnuja’s divine body as one that is extremely pleasing to those who surrender unto him. His body is full of individual features that reflects beauty at its best. The features are so soft and tender like those of a freshly blossomed flower. As they say “rUpamEvAsyai thanmahimAna mAsashtE”, SrI rAmAnuja’s divine body is bright and effulgent as paramAthama (SrIman nArAyaNan) radiates from within. maNavALa mAmunigaL sings glories to such a divine form that it should be there forever as per the SAsthra vAkhyam “nithyam nithyA kruthitharam”. Next, maNavALa mAmunigaL sings glories to the sacred thread (a set of three strands) that reinforce the fact that he is a great follower of vEdhic scriptures and abides by it meticulously. The sacred thread on SrI rAmAnuja’s body is akin to a sheath of silver on an evening sky. Long live such a sacred thread. Next, maNavALa mAmunigaL sings glories to the gorgeous shoulders of SrI rAmAnuja and wishes that they should be there forever. The greatness of SrI rAmAnuja’s shoulders is described in detail by maNavALa mAmunigaL. As per the phrase “bhAhuchchAyamava ashtabdhOsyapalakO mAhAthmana:”, the shoulders of SrI rAmAnuja are something that acts like branches of the golden kaRpaga tree that provides shade, shelter and comfort to all people who are under it. The shoulders are capable of granting anyone the mOksham. They are capable of uplifting and thereby liberating the most downtrodden in this world. The shoulders are broad and big because of this ability to grant and lift people. As described in gyAna sAram pAsuram “thOLAr chudarththigiri sangudaya sundharanukku (gyAna sAram 7)”, the shoulders of SrI rAmAnuja are powerful. They are adorned with garland that are made of thuLasi, vaguLam and naLinAksha flowers. maNavALa mAmunigaL wishes that such matchless shoulder of SrI rAmAnuja should live forever and sings glories to them. Next, maNavALa mAmunigaL looks at the face of SrI rAmAnuja and starts to sing mangaLAsAsanam to it. As per the descriptive phrases like “brahmavidha iva sowmyathE mukham pAdhi”, and “mugachchOdhi malarndhadhuvO (thiruvaimozhi 3.1.1)”, the glow of SrI rAmAnuja that does not have any bounds, is pure and effulgent. This is caused by (a) the happiness derived from seeing SrIman nArAyaNan and HIS devotees (b) the process of destroying the arguments of non devotees. Next, maNavALa mAmunigaL sings glories to the beautiful and charming smile of SrI rAmAnuja. As per the phrase, “sa vilAsas smithAdhAram bhiprANam mukha pankajam” SrI rAmAnuja’s face is compared to a beautiful lotus. In the lotus called face, there emerges a beautiful smile, as if described by AzhvAr’s “nin pal nilA muththam thavazh kadhir muRuval seydhu (thiruvAimozhi 9.2.5). The cause for this smile is because of (a) happiness derived from protecting the devotees and (b) the enjoyment of being in unison with SrIman nArAyaNan. maNavALa mAmunigaL wishes that this beautiful, moon like cool smile that is similar to a blossoming flower, and that radiates these aforementioned happiness SrI rAmAnuja derives, should be there forever. After this, maNavALa mAmunigaL sings glories to SrI rAmAnuja’s divine eyes that sees two things always, namely SrI ranganAthan and SrIvaishNavaSrI that includes all those who were corrected and taken unto his fold by SrI rAmAnuja. Those eyes always ooze out compassion towards fellow beings. Those eyes bless those who surrender unto him to be completely devoid of ignorance as revealed by “amalangaLAga vizhikkum (thiruvAimozhi 1.9.9)”. maNavALa mAmunigaL wishes that such wonderful pair of eyes should be like this forever. Next, maNavALa mAmunigaL sings glories to the beauty of SrI rAmAnuja when he adorns the twelve “thirumaN kAppu” (dhvAdhaSa Urdhva puNRam). The “thirumaN kAppu” on SrI rAmAnuja, that stands as a manifestation of aforementioned qualities (in the earlier lines of this pAsuram) is something that resembles white lotus flowers that blossoms over a golden mountain. 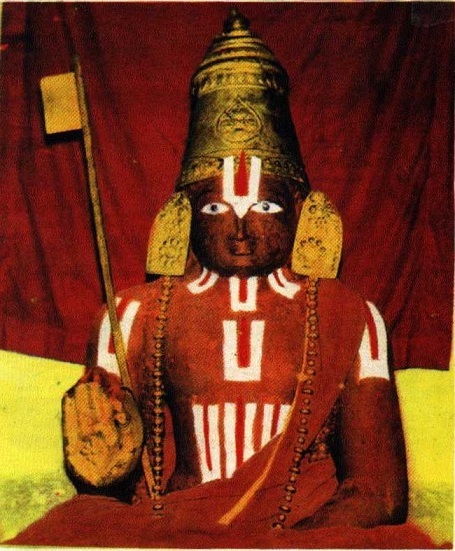 SrI rAmAnuja’s body is glowing (yellowish red) and on this body, the “thirumaN kAppu” is shining brightly. maNavALa mAmunigaL wishes that this beauty of SrI rAmAnuja should be there forever. Finally, maNavALa mAmunigaL glorifies the pose (mudhrai) of SrI rAmAnuja‘s fingers and wishes that his mudhrai should be there forever and not for some short amount of time. SrI rAmAnuja came to this world as per the desire of SrIman nArAyaNan. He came to this materialistic world, conquered everyone one and all, be it his devotees or his opponents, thanks to the causeless cause of SrIman nArAyaNan. Having done that, he majestically sits like a king swan. A guru is often compared to a swan who is able to differentiate things and sits majestically in his throne as per “vaiyam manni vIRRirundhu (thiruvAimozhi 4.3.11). thirumangai AzhvAr also referred as “annamadhAy irundhangu aRa nUl uraiththa (periya thirumozhi 11.4.8)”. As described in the phrase “padhmAsanOpavishtam pAdhadhvOpOdhamudhram” (parAnkuSAshtakam), SrI rAmAnuja, the chief of gurus, is seen sitting majestically amidst lot of his devotees, while seated in a padhmAsanam and sporting the gyAna mudhrai (pose that represents knowledge). As in the usage of “SrI” in “SrImath thadhangriyugaLam”, the phrase “sIrArum” in this pAsuram should be treated as an adjective to the lotus feet (thiruvadigaL). This entry was posted in Arththi prabandham, Other on November 30, 2016 by santhanam rajagopalan.